Rethinking Hobbes and Kant argues that predominant approaches to the theoretical relationship between Hobbes and Kant have reached conclusions that were pre-digested in assumptions about the ‘isms’ which these two writers are propounding. 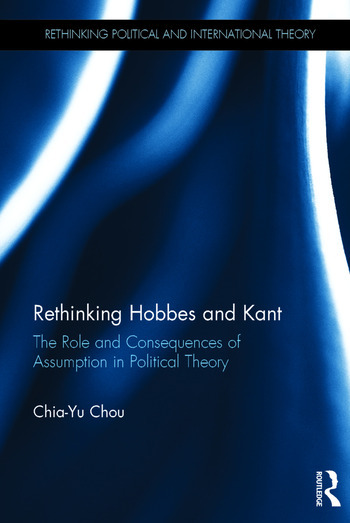 Chou shows how these assumptions have inhibited commentators from recognising the affinities between Hobbes’s and Kant’s political philosophies, or, if they have, prevented them from providing a plausible explanation of those affinities. To provide a fresh understanding of the relation between Hobbes and Kant, this book examines and compares what they actually wrote about some central conceptions in political theory, as it becomes visible once the assumptions out of which they are formed are set aside. Chou argues that what matters is that that we reflect upon our own assumptions, and that we have at least some conscious awareness that the assumptions of our day were not held all the time and everywhere, and that we do not reify them into crude models which distort the thought of the past and the present in equal measure. This book therefore seeks to bring into the arena of conscious thought assumptions which are deeply rooted in many modern minds and which work to distort many current studies of the relationship between Hobbes’ and Kant’s political philosophies, with negative consequences for the understanding of Hobbes, of Kant, and of politics itself. Providing a fresh understanding of the relation between Hobbes and Kant, this book will be of great use for graduates and scholars of Political Theory, Philosophy and Political Sociology.